Harold Dwayne Stoner, son of James Earl and Marian A Brown Stoner, was born, May 8, 1943 in Camden County, Missouri. He departed this life, February 1, 2019, in Osage Beach Rehabilitation and Healthcare Center, Osage Beach, Missouri at the age of seventy five years, eight months and twenty four days. He was preceded in death by his parents James Earl and Marian Brown Stoner and brother David Vincen. He is survived by his father, George Shughart of Climax Springs, Missouri,; two sisters, Mary Crider of Camdenton, Missouri, Connie Camerer and husband Monty of Adrian, Missouri,; brother-in-law, Eugene Dority of Climax Springs, Missouri, and a host of nieces, nephews, other relatives and many friends. Harold was raised in Camdenton, Missouri and attended the Camdenton School District. Harold made a profession of faith and was a member of Myetta Baptist Church. 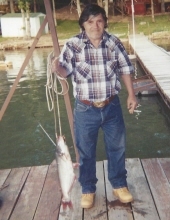 In his spare time he enjoyed fishing, playing poker and spending time with family and friends. He was a loving son, brother, uncle and a caring neighbor and friend. We celebrate his life and his accomplishments and will treasure the memories he created for his family and friends. Funeral services will be at 10:00 a.m., Wednesday, February 6, 2019 at Allee-Holman-Howe Funeral Home. Visitation will be from 5:00 p.m. to 7:00 p.m., Tuesday, February 5, 2019 in the funeral home. Burial will be in Decaturville Cemetery, Decaturville,Missouri. Memorial donations may be made to Myetta Missionary Baptist Church and left at the funeral home. Arrangements are under the direction of the Allee-Holman-Howe Funeral of Camdenton, Missouri. To send flowers or a remembrance gift to the family of Harold D Stoner, please visit our Tribute Store. "Email Address" would like to share the life celebration of Harold D Stoner. Click on the "link" to go to share a favorite memory or leave a condolence message for the family.